It is safe to say that no two companies are the same. What works for one, might not work another. Businesses have different sales cycles, management, etc. With that being said, a personalized approach is necessary. Knowing this, Flexie not only has standard fields like title, first name, last name, phone number and email address, but it also lets you add your own custom fields in order to fit your needs. You may want to add an optional email address, or maybe you want to add an alternate phone number. You can do all this and more, much more with Flexie. Note that, unless given permission by one of Flexie’s administrators, users cannot add new custom fields. You can create as many custom fields as you want. To illustrate with an example, let’s say you want to add a new custom lead field. Navigate to Leads on the menu on the left side of the screen, and then click Manage Fields. Give it the field a name, an alias(optional), choose the type(it can be date, date/time, email, string, phone number etc), selected a default value(optional) and then choose a category. Some of the categories are by default, while you can create your own categories. Once you have filled in the fields, click Apply on the upper-right corner of the screen. You have just created a custom field. Each attribute serves a specific function. Say you create a new custom field, say Web address. If you set Publish to Yes, you can filter it on the column selection menu, and it will appear on the main leads table. If you set it to No, it won’t appear. The Required attribute is self-explanatory: if you set it to Yes, the custom field Web address will be required when filling in a lead form, for instance. If you set it to No, it won’t be no longer required. The Is Unique Identifier attribute serves to give you an accurate and precise way of identifying a lead, or any other entity for that matter(contact, account or deal). For example, an email address is a unique identifier. It is unique and it cannot belong to two different leads. In our case, if you set Is Unique Identifier to Yes, the Web address serves to identify the lead uniquely. If set to No, it will not serve as an unique identifier. The Inline Editable attribute allows you to edit the custom filed Web address in the main table, if you set it to Yes. You can either change it, delete it, or simply leave it as it is. If you set Inline Editable to No, you won’t be able to modify the Web address field in the main table. The Is Sortable attribute is self-explanatory: if you set it to Yes, the Web address field will be sortable in the main table. If you set it to No, it won’t be sortable. 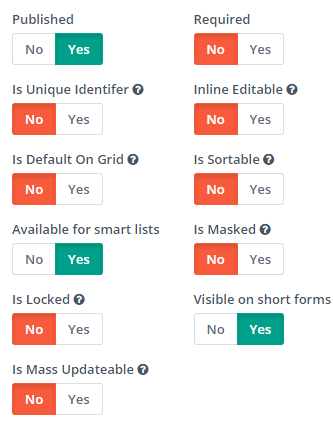 The Available for smart lists attribute let’s you decide whether you want to include the custom field you’ve created (in our case Web address) in the smart list filters or not. If you set it to Yes, Web address will be available in the smart list’s filters. If set to No, it won’t appear there. The Is Masked attribute will mask the value of the Web address field in the main table if set to Yes, and it show the custom field’s values in the main table if set to No. The Visible on forms and Visible on short are two other attributes. If set to Yes, the Web address custom field will be included in forms. If set to No, they won’t appear on lead’s forms. If you set the Is Locked attribute to Yes, you won’t be able to edit the Web address custom field in the main table, unless you give permission to do so. Set to No, you can easily edit the custom field in the main table. Finally, the Is Mass Updatable attribute. If set to Yes, the Web address custom field can be updated through mass update in the main table. If set to No, you cannot update the custom field from the mass update section in the main table. Notice that if you set Web address, our custom field, as a unique identifier, you cannot mass update it.